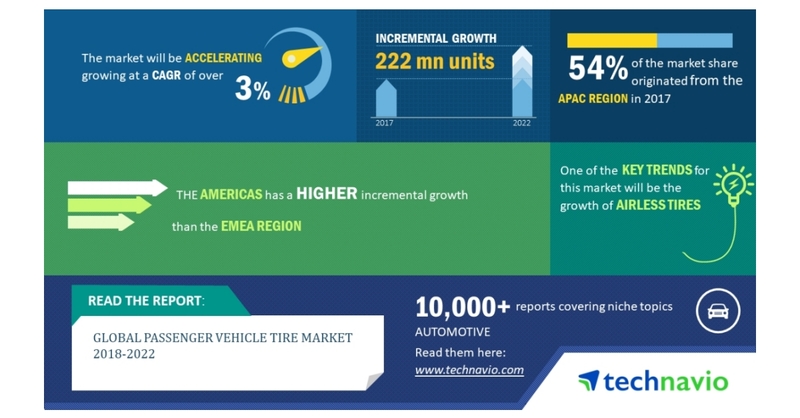 LONDON–(BUSINESS WIRE)–The global passenger vehicle tire market is expected to post a CAGR of over 3% during the period 2018-2022, according to the latest market research report by Technavio. A key factor driving the growth of the market is the rise in sales of passenger vehicles. Increasing sales of passenger vehicles, such as sedans, hatchbacks, Sports Utility Vehicles, Multi-Purpose Vehicles, crossovers, and passenger vans, are driving the growth of the global passenger vehicle tire market. Sedans and hatchbacks also contribute significantly towards the market growth. In countries such as China and the US, SUVs and crossovers witnessed most sales. The passenger car market in Europe and the US recorded significant growth, with growth rates close to 6% and 4% respectively. This market research report on the global passenger vehicle tire market 2018-2022 also provides an analysis of the most important trends expected to impact the market outlook during the forecast period. Technavio classifies an emerging trend as a major factor that has the potential to significantly impact the market and contribute to its growth or decline. Airless tires or non-pneumatic tires are those that are supported by air pressure. Most of these tires are used in small vehicles, such as riding lawn mowers and motorized golf carts. These tires are also used for heavy equipment, such as backhoes, which are used to demolish buildings. These tires are composed of closed-cell polyurethane foam, which is also used to make bicycle and wheelchair tires. The main advantage of these tires is that these tires are not susceptible to punctures. “Companies such as MICHELIN developed a tire called Tweel, which did not have the conventional wheel hub assembly. Tweel has a solid inner hub, which is mounted on the axle, which is then surrounded by polyurethane spokes arrayed in a pattern of wedges. The shear band, which is stretched across the spokes, forms the outer edge of the tire. This shear band helps to replace the air pressure compared to the traditional tires, which are supported through the tension of the spokes. The tread of the tire is then attached to the shear band for creating smoother traction when in contact,” says a senior market research analyst at Technavio. This market research report segments the global passenger vehicle tire market by end-user (replacement and OEMs) and geographical regions (APAC, EMEA, and the Americas). The replacement segment held the largest market share in 2017, accounting for nearly 70% of the market. This end-user segment is expected to dominate the global market throughout the forecast period. APAC led the market in 2017 with a market share of nearly 54% of the market share. The market share occupied by this region is anticipated to increase during 2018-2022.